This Weeks Blog-What’s in the Bag for a Photo Shoot? The answers will vary from one photographer to another and it will also depend on the type of photo shoot. From my end, I will say that I always bring my camera bag which contains 8 lenses, 2 camera bodies, 8 memory cards, 4 battery chargers, 4 batteries, lens cleaning supplies, a few lens filters, and the Holy Grail for photographers…the camera manual. I also carry an additional bag with 1 body and 2 lenses plus a few other things, but this almost always just stays in my truck. The lenses are 1 of the main ingredients in creating great images. From the photo below, I showed just 4 of the lenses I normally use. 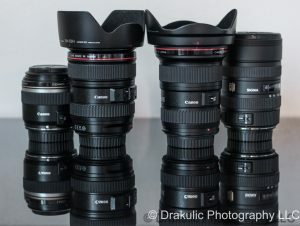 The 2 lenses with the red lines are considered Canon “L-lenses” and are pretty expensive higher end glass. For the life of me I still cannot figure out why some lenses are so costly. I mean, c’mon, they are mostly just glass and plastic! Either way, I regularly use 2-zoom lenses, 2-wide angles (1-ultra wide,) a prime portrait lens, and a prime macro lens, for those finer detailed close up shots. I’ll also bring a large Speedlite flash unit, a reflector (to kick back some light at my subject if needed,) and my tripod, which I never leave home without. If it is a corporate shoot things can get much more extensive. You may be required to bring additional soft box lighting systems and/or strobes, light stands, a large backdrop and the stands for them, multiple reflectors, and if you are lucky enough…an assistant. In those instances, I’m not ashamed to say that I put them to work by carrying a lot of the equipment, haha! As I’ve said in past blogs, I don’t emphasize the equipment as much as the creative mind and process thats truly needed to get great looking shots. Having nice reliable equipment is a bonus though. Almost always a PROFESSIONAL photographer will have backups (or quadruples) of everything and will be set up, ready to shoot, on time, with all of the accurate legal contracts in place. I capitalized “professional” because there are a ton of amateurs masking as professionals out there, and also…(and I may piss someone off here reading this blog) “Momtographers.” Always, always, ALWAYS, ask your photographer for legal contracts, what experiences they have, and find out “whats in their bag” for ANY shoot, prior to hiring them. So thats that. Until next time, have fun! As always comments, questions, suggestions, and critiques are encouraged!